Rolf St. James has been sent by the king to settle the Scottish lands once and for all. He's not about to let a woman get in his way, no matter how desirable he finds her. He must put aside his attraction and fulfill his duty to permanently quell the rebellion, regardless of the cost. Rolf represents everything her father hated, everything she's been fighting against. But as the days pass and Rolf's code of honor reveals itself, Megan finds it's not so easy to hate him anymore. Can she risk her people's future for a chance at personal happiness? 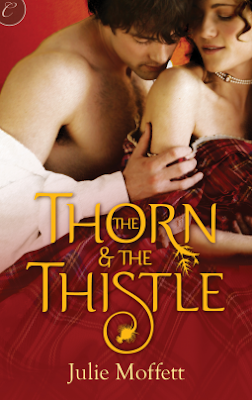 The Thorn & the Thistle is a historical romance that really wraps one up in the plot. Julie Moffett knows how to rouse readers with a strong, stubborn heroine and keep them entertained with drama, action, and passion. I've always been a fan of historical fiction novels that take me back hundreds of years to Scotland or England, but this is my first time reading a story that sort of gives me both in one. Megan lives in a time where the Scots resist English rule and war could very well be on the rise between the two countries. And while the majority of the novel is set in Scotland, following as Megan takes the lead in the rebellion after her father's demise, one can't overlook the moments where the curtain is opened to the background of Englishman Rolf St. James. Rolf is commission by the king to bring peace to lands in Scotland, but it's hard going with the legendary Black Wolf causing problems. When he captures Megan believing she could be a bargaining chip against the Black Wolf, the plot thickens with Moffett's promising characterization and heart-racing storytelling. There were times when I wasn't all that crazy about Megan, but she proved time and time again that she was no weak character. Stubborn characters have the tendency to come across as being horribly over-the-top or spiteful, but Moffett balances Megan's stubborn streak with her fierce loyalty and ability to think and understand. Her ability to love, even if that love is for someone she's been raised to hate, is what's most admirable, though. Rolf was a mysterious character that turned out to be everything one would love to see in a romantic interest: an honorable gentleman. Though the romance was a little slow, or more so interrupted by the drama between the Scots and English, Moffett deserves an A+ for the passion readers will see ignite. The historical element is strong, but Moffett delivers on entertainment so that the story remains engaging and unpredictable. I recommend The Thorn & the Thistle to romance readers of all kinds!